Buying worms is easy and Shipping is Free! 2. 1 lb of Red Worms $35 (EISENIA FETIDA) Winter is here and shipping may be delayed. 3. 1 lb of European Nightcrawlers $35 (EISENIA HORTENSIS)Winter is here and shipping may be delayed. Enter your shipping address (if applicable) in the PayPal “Notes” section. Call 210-310-5046 or email KyleHarrell@hotmail.com to arrange local pick up, for bulk orders, or with any questions. • All Starter Worm Farms come with free shipping and include bin, bedding, castings, worms (mature, juveniles, hatchlings and eggs), and food. Weighs about 3 lbs. A ready made worm composting system that provides everything you need to produce nutrient rich castings for your plants and soil, and Texas raised earth worms. 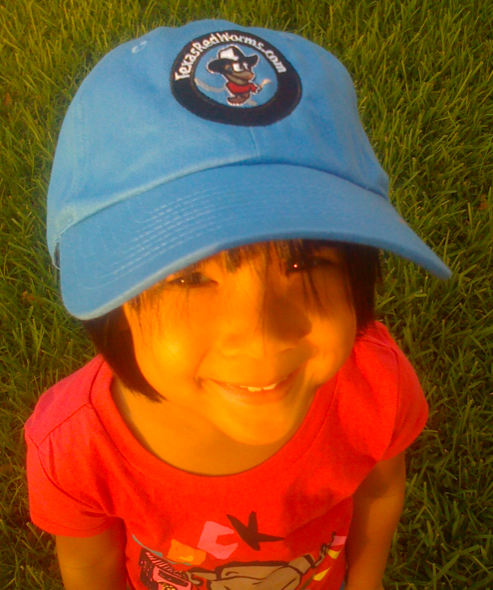 Thanks for your purchase with TexasRedWorms.com. Thanks for your support of our family. I have a question. I have built a 5×5′ area in my goat barn to a height of 2 feet with alfalfa litter from the goat pens and soil. I live in an area with about the same temperature range as San Antonio as I live halfway between Rocksprings and Roosevelt, Texas. The area is protected with cattle panels so that nobody, goats, chickens, guard dogs, or guinea fowl can get in there. I want to try red worms in there as the base of the area would probably be so hard and rocky they won’t go anywhere. Do you think it is worth a try? The set up sounds good, a couple things you will need to keep in mind: Shade, will they be out of direct sun? Will water collect? Adequate drainage will be important especially in your rocky soil? Keeping the bedding moist will be critical especially as the temps rise. Hopefully, this helps. Let me know if I can answer anymore questions. Hi there. I was wondering how much your red wiggler worms are per pound. Can I purchase them seperately since I wont be needing the little starter kit? I live in San Antonio, Do you have a store or buisness address I can come to? This would be easier and faster for me than the mail. You bet. I raise them at home, and would be happy to meet somewhere convenient. Shoot me an email or give me a call when and where would work best. My wife raises rabbits. Lots of poo. Can worms help? What do I need to do? Yes, a worm bed makes an excellent compliment to a rabbit pen. You can add worms and other food waste under the rabbit hutch where the manure collects, and the worms will do the work. They will speed up the composting process and yield a pH neutral, nutrient rich, finished product that you can add directly to plants and soil. I would like some of the rabbit manure. Send me an email. Thanks for the Jumper order they will be on their way to Porter tomorrow. Unfortunately, don’t have any rabbit manure for you just worms. Are you still selling worms? I’d like to get some Alabama Jumpers to aerate my raised bed and maybe some red wrigglers for my compost pile. I live in San Antonio, I could come to you if that's easier. Probably be better for the worms. Actually, I'd rather do that. Yes, I would be happy to help. You are more than welcome to come by for a pick up. To order by PayPal, just click the link and indicate what you would like in your order and where you would like it shipped. I will email a confirmation. The PayPal link indicates donation, but it is a purchase. The version of wordpress that I am using for the blog for some reason only allows the PayPal link to show as “donation”. My apologies for the confusion. Please feel free to call or email anytime. Alan, Thanks for coming out. I look forward to talking to you soon. Give me a call 210-310-5046. I would be glad for you to come by. I’m in Naples, FL. Have a veg garden 4×8. How many Alabama jumpers do I need in my raised bed? Thanks Kyle for bring by another container of red worms. I appreciate your professionalism and personal service. Much to my dismay, we have acquired a cat that seems to think that our front garden near our front door is her new litter box. Would worms help in this area? If so, how? The worms will help w/ break down the cat waste, but you will need to make some preparation in the bed to make it a “worm bed”. Keeping it moist and adding organic matter will help, as well. I have a 60′ long x 6′ wide garden for shrubs and plants as well as about 2000 sqft of lawn that I would like to attempt to use alabama/texas jumpers to assist with aeration and the breakup of heavy clay. My garden is surrounded by a stone wall and is raised from the yard. I have tilled the garden thoroughly as well as added a layer of compost/hummus to my garden along with some planting mix soil and a lot of bark mulch. My questions to you are, Is this a good idea for me to do? How much worms would I need if so? What might be the timeline that they could help? How much would this cost? Can they be shipped? It sounds like you are off to a great start. Yes, you can add worms. I recommend starting with one or two starter farms to see how they do. How much time depends on the amount of worms, temperature, moisture, and amount of organic matter. Under good conditions they can lay eggs every 7 days or so, and double in population in around 90 days. Yes, shipping is $10 and usually takes a couple of business days. How much would it cost to just buy 1 pound of each worms separately? Jumpers are sold by starter farm only at this time: $40 + shipping. Please call if you have other questions. What do you do with your worm farms during the winter? I live in Houston and wanted to start a worm farm. Should I wait until the spring? Winter is not a problem in Houston, and you can start anytime you’re ready. Steven, should it get unusually cold you can bring the worms inside, they don’t smell. or get out and roam around. I started mine in my (clean and modern) kitchen with no problem at all. “Red worms (Eisenia Fetida) do best in temperatures between 55-77 degrees Fahrenheit, but can survive from 40-80 degrees F. Outside worm bins are subject to the elements and sometimes much more extreme temperatures in Summer and Winter. If you are determined to keep them outside a worm pit is an effective way to combat these extreme temperatures. The underground temperature holds a more constant temperature. Thermal inertia means that below ground temps. stay cooler that air temps. in Summer and warmer in the Winter. Will your worm kit grow worms in the pan handle of Florida? Yes, many folks are successfully raising worms in Florida. I live in Richmond, TX (southwest of Houston) and am interested in the Alabama Jumpers but am concerned about fire ants getting them when first released. Do you have suggestions on how I can release them and not have them attacked by the fire ants? Food grade diatomaceous earth will take care of fire ants. As long as its dry, sprinkled around it will stick to the bodies of insects and make tiny cuts that will dry them out and do them in. DE is natural and won’t hurt your worms. After receiving a worm farm how long can they stay in the box they come before they need to be moved to something larger? When moving them to another container, what do I use in the new container? Thank You. They will be fine for several weeks, possibly a couple of months. The reason you want to move them into a larger area or split your bin is to give them more room and food to reproduce and grow. I start new bins with aged compost that is cool and moisten it with a spray water bottle. Last, I lay on top some cardboard or newspaper as a mulch blanket to keep them cozy and moist. Thanks for the question and the time on the phone this morning. I will be shipping your redworms today. I look forward to your feedback. I have a big yard and my question is if I just let the Alabama jumper go all over the grass or do I have to dig a hole in the grass and put the alabama inside the hole. You want to dig a small hole and continue to feed in that spot. You will want them to stay close together so they can locate one another and populate. Once they are established you can repeat the process and continue across your yard. In a raised bed of that size I would suggest one box of jumpers. Approximately how many jumpers come in 1/4 order? I have 4 x 8 raised garden bed ,would this amount suit my needs? I’m looking to improve the drainage of my garden and add to the organic matter i’ve tilled in over the years. I haven’t been able to work out the clay based top soil i started with and from what I hear, these worms will do the trick or help with my drainage problem. Thanks in advance for your help! Received the Red Worms and Europeans! Lively and healthy! How much can they eat in one week? Can they eat their weight in a couple of weeks? Squash, potato peelings, coffee grinds, stale lettuce, food such as this mixed in with their peat and newpaper clippings. Thanks. Fresh table scraps probably need to be limited to a handful a week per pound of worms each week in one corner of bin. Composted waste that is cooled down can be fed a little more liberally. Conditions like temp will have an impact on their appetite. Monitor every few days and see how food is being consumed. I understood that red wigglers (eisenia foetidia) eat approximately 1/2 their weight daily – meaning a pond of red wigglers would eat 1/2 pound of kitchen waste per day. Is this not true? That is possible, but conditions vary (temp, moisture, contents of food). You will get to know your worms and see how quickly they eat certain types of food. Outside temp has a lot to do with how active worms are. Heat of the summer and cold of winter usually slow production down. Just out of curiosity before I buy the Alabama jumpers, which species are they? I’m uncertain if they are the unmatured gracilis, the mature agretis, or one of various species within the family. Great question. To the best of my knowledge they are immature gracilis. If you want to discuss further, feel free to give me a call at 210-310-5046. A)Will you guarantee live delivery to the NYC area? B)What is included in your Alabama Jumper Farm kit? D)When I place in garden beds, will I have to keep a constant supply of organic matter(newspaper, cardboard, cofee grounds, tea bags…etc)seperately in my beds? or will worm castings, along with sphagnum peat moss already in soil, suffice? Yes, we will guarantee live delivery. So we will need to keep an eye on temps on your end to make sure we are not sending into extreme temps. The kit is about 1/2 lb of jumpers and their bedding pulled from my Jumper bins. I would wait until the thaw to introduce your Jumpers to your bed, and for the next few months just bin raise them like your other species. For the best results you will want to continue to feed, they could do fine without it, but you want to give them a reason to stick around and produce more. How many AJ coming in a 1/2 pound? Depending on the size of the worms 250-500 worms in 1/2 lb. Just ordered a pound of red worms to start my composting with! Excited to get started and to order from a local company! Google Ad – Words (I am in no way affiliated with Perry Marshall). That is exactly what the network marketing system is like. Yes, Anson has things going well. I spoke to him recently. I’m waiting on him to send me a link so that I can post it. We started raising (1 pound) Red Wigglers for 18 months. We now have two 4x8x16 concrete block ground beds. We feed them produce waste from the produce market on S. Sarzamora and juice pulp and spent beer grain. We will not sell any worms until we have over one million worms. Rudy G. and Pam Green. 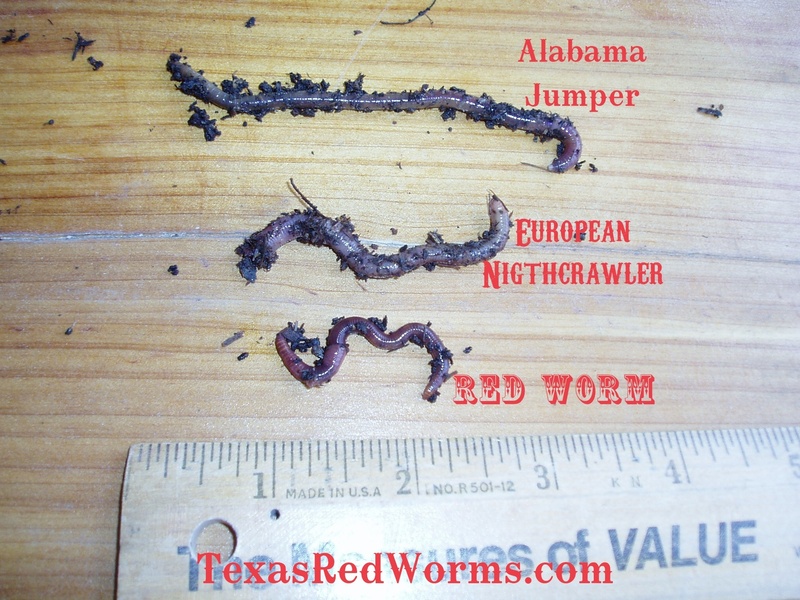 ARe the TEXAS JUMPER FARM WORMS the alabama jumpers im guessing? and about how many works are in a 1/4 lb? Can’t tell you they are the exact genus species, but do the same kind of work. Number varies depending on size of worms. I live in San Antonio, if I order worms today, how soon can I expect them? It depends what worms you are looking for and what our current inventory of them is. Usually you can arrange a pickup same day. Im interested in the starter kit. I’m from san antonio can we arrange a meet? The European is an excellent choice for fishing. It tends to fatten up faster than other species. Many folks bring them indoors to survive summer and winters. The only worm in my experience that can handle outdoors all year long in Texas is the Jumper. Others can if you have a large enough container that will insulate from the extreme temps. You can order the 5lbs online. Buy Worms tab option #5. We ship all the time. Tea is best fresh brewed. It needs to be used within 6 hours of coming off of air source. Can I add any of your worms directly to my lawn area with clay soil?